Decades have passed from the time that Krivox had last encountered anyone, and was the last time he was ever heard of. Without the knowledge of him having a niece in his time away of exile, it led to the start of a journey for the Infernic Dragon. Terrain: Covered in wastelands of ice, large glacial continents and structures cover the whole planet. Temperatures reaching near sub-zero, according to Giru. A new chapter begins in the long book of stories for the Inferna lineage. As its written so far, the Infernic Dragon has been through many battles and trifles with those who have had exponential power. Through it all he always had his friends and family he'd grown with by him. Later in his life was once the emperor of his home planet, he ruled it with passion and integrity. Until one day a matter arose within his family, due to mis accusations and a long time personal quarrel with his brother Damion, his father exiled him from the planet. Bequeathing the leadership and title of emperor to his stubborn and foul brother to follow, Krivox had no other choice to leave the planet and the universe for which Planet Inferna orbited. Being banished from the very place he called home, the Saiya-jin was fueled with a rage he had never felt in his lifetime. It was one uncontrollable emotion, equipped with a cold heartache as its foundation. It hurdled him into a long state of regression, his mind flooded of the memories he was so fond of with those he had close. With all that has happened now, it was evident that there was no one there for him left. It was a fact that his friends and family were the ones who made him feel any significant purpose, and now he was left alone in the wind. Sending him to a place in his mind he wasn't aware of, he went along with what he was portrayed as, a traitor in this life. Traveling to the farther depths of the solar system of the closest universe to of which he was banished, he found a place for which he called his new home. Known as the planet of Polaris, it was an ice planet that was in the cold depths of the 3rd universe. A planet of sub-zero temperatures, being cold enough to instantly freeze carbon monoxide and liquids of different universes due to the atmosphere of location the planet of Polaris orbits in space. Home to a small handful of species of wildlife that are able to live in its environment, it has but one form of civilization with the race known as the Zoonamites. In his home universes there was a species that looked just of the same nature known as "Fishmen." The Zoonamites were able to live off the water the planet Produced from the reserves beneath the crust of the planet. They fed themselves from the meat of the Thundra Wolves and Ice Crabs that invested the planet. There was also various kinds of fish, all of a more reptilia nature but still had the resources of that aided the Zoonamites. 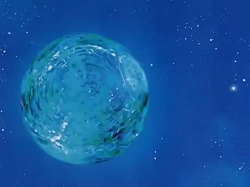 The planet being of such unlikely living conditions for another of any race or being, it was the perfect place for the solitude of whom has the blood of a Saiya-jin. It had been decades as the flow of time continued on, day after day it seemed to be like a never ending nightmare that cycled in his head. As the years passed he aged, but he still felt stuck in the frame of time of his banishing. Though he was so lost, there was one thing he never lost sight of and that was the pride he had as a Saiya-jin. Very lost, his habits and way of life never had never left his very well being. This meant his training never came to a cease, from the time he left Krivox never lost his sight of becoming stronger and reaching for more power. In the end he knew he would again have to fight someone, someday to save someone, or very well himself. He continued to harness his Pyro-jin capabilities, constantly opposing the very element that would put out his flame, it drove him to have an even stronger will to simply survive. It was a day as any other, the freezing breeze blew over his small home he constructed within a large glacial mountain upon one of the ice continents that was on Polaris. Traveling to the nearby planets Krivox grabbed supplies and things he would need that made it a hospitable place for him to live in. The ever reproducing thundra wolves was one of the planets best attributes, being a resource he could live off and form of training for the warrior. Being a part of his daily routine and training regime, he ventured to the icy wastelands where there was the densest population of the animals. Being adapted to the harsh conditions of the planet, the thundra wolves were much more ferocious and hostile than that of the regular wolf of his home universe. Being versatile in combat as well and smart with tactics, they proved a worthy opponent for the Saiya-jin. Once upon his arrival of the area he commenced in his task, throwing down to the side a large bag he brought with his expression became serious. As the word he said ever so faint to himself left his mouth, the moment his feet came in contact with the icy floor with his aura expanded outward into a gust of wind all around him. The force of the wind hit the wolves that were fifty meters away from where he stood, causing them to slide a couple feet. Easily catching their attention and agitating them, the wolves came at him with deathly intent. Slowly he slide his feet and raised his arms, standing in a battle position he focused on the incoming wolves. Dashing directly at the wolves he threw his arm to the side striking the leading wolf, sending it flying at the two others right behind it. It knocked the three into the nearby ice structures that surrounded them, he refocused on the other two that still pursued him. Re positioning his stance he stood firm as the others became close. Everything was normal, but then suddenly Krivox lost his breathe out of no where as his eyes refocused to the sky above him. "What is this power...... and how did it find me?!" The two attacking wolves pounced at Krivox, being completely distracted they both latched their fangs on to him tackling him to the ground. He regained his senses with the fangs of one of the wolves puncturing his battle spandex upon his right arm. The other had its fangs on his torso, which he was luckily protected by with his Saiya-jin armor. Still baffled with such an incredulous power coming towards him he laid for a moment staring into the eye of the wolf that was biting his arm. The growls were ever so ferocious, though it sounded like a peaceful hymn as he seen himself reflected in the wolves optic. For which reason would someone be finding him on this planet, and how? This is the only thing he could see before him, as he looked into the wolves eye lost in thought. It was then slowly flames started to accumulate around him, as they burned quicker in intensity around him the wolves loosened their bites as it slowly started to burn them. As the fire continued they still tried to attack him as he laid there speechless. A sudden flashback of the past then hit him, as the rage did. With a scream the aura circled around him and exploded. Ice flew in every direction as the wolves were sent hurdling away. Standing in a small crater that was left from the explosion of his aura, the Infernic Dragon stood with his aura still rapidly circling him looking into the sky in the direction of the power. The flames that emitted melted the ice all around him of where he stood. Fists clenched at his sides, he knew this could only mean two different things for what was to come. The first being someone that could be a direct threat and that was coming to harm him. The second was it was someone of his bloodline that was able to locate him being a Pyro-jin, still possibly being a direct threat.